Are you tired of digging through piles of stuff in your garage to find the thing you need? The solution can be found in the old adage, “A place for everything and everything in its place.” Here is our list of 5 things you should have in your new garage and the best place to put them so you can always find them. Before we get to our list, let us make this quick point. 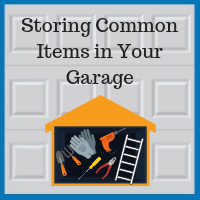 One of the challenges of garage storage is that you cannot always use the same types of containers that you would use indoors. Fabric bins with open tops may work great in your bedroom closet or toy room, but in a garage, they are going to be filthy inside and out in short order. Cardboard boxes are also bad for a garage because of dampness. Instead, use clear plastic storage bins, wire bins, hooks, bungee cords, and magnet strips. 1. Gardening gloves and tools. Hang a sturdy wire bin on a wall convenient to a garage door that you typically use when working in the yard. Choose a bin large enough to hold your gardening gloves, weeding fork, gardening knife, and similar hand tools. Make sure the bin is large enough to hold your kneeling mat, too. If you hang a few hooks or clamps off the bottom of the bin, you can use them to hang up your lightweight gardening clogs or wet gloves. You can also use the hooks to hang tools that have straps or holes in the handles. Wire bins are very popular these days as part of the farmhouse/rustic chic decorating style, so they should be easy to find. Why wire? Because it won’t hold dirt and water the way a solid bin will. This one is easy: pick up a clear plastic bin with a clamp-on lid that is big enough to hold the power tool and a smaller plastic tub inside to contain bits and accessories. You may not even have to buy the smaller plastic tub. Just stalk the kitchen for a plastic margarine tub or the tub that dishwasher detergent pods come in. We recently found the perfect place for a boot scraper in the garage, but this spot only works if you have two separate overhead garage doors. Put it on the floor between the two doors. It should fit perfectly. Are you tired of having ladders leaning up against walls and fighting past them when you need to get at a shovel or some other item stuck behind the ladder? Give the ladder a place to hang out–on the wall. Just screw a couple of heavy-duty U hooks, also known as ladder hooks, into the studs. Mount foot-long magnetic strips near the main door so you can grab these tools easily whether you are working indoors or outdoors. You can buy a couple of these strips for under $20. Do you want your garage done right? Choose Blue Sky Builders. 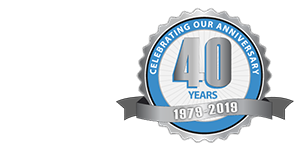 We have been running our Downers Grove custom garage building business for 40 years and are still going strong. For a free estimate on your project, call us at 630-852-8485.